While the Christmas fevers grips the city and the nation, the consumers will be delighted with the gifts and shopkeepers will smile as their pockets are loaded. The sizzling stars, snowy Santa, sound of carols and the very beautiful Christmas: all of these attracts the eyeballs at any location, be it mall or a high street. The festive season of Christmas and the New Year celebrations have started roping shopping enthusiasts across the nation where Christians are counted a minority. The trend of indulging in the spirit of Christmas has been well noted by the shopkeepers. A couple of years back Diwali was the time of the year when the whole city, people across the class used to come out on the streets to purchase clothes, décor items and goodies. Now, for the good of our retailers this happens at this time of the year as well. The Western influence has helped to this positive change for shopkeepers as this become the pick of the months where the time is all about gifting. Television and movies have also ramped up the influence of gifting. Bipasha Basu brings in goodies for the Big Boss contestants. Similarly on other soaps the festival spirit is cashed and this percolates into the minds of our people where the younger generation starts expecting gifts from their relatives and friends. The colours of Christmas – Red and White are seen even at the traffic signals where the small children can be seen selling Santa caps and gloves. 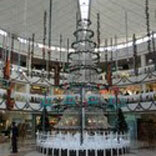 From big stores to street vendors, everyone stocks up Christmas merchandise to attract customers. People have also been waiting for this season to arrive as they were expecting discounts and offers given by the retailers. They will not be disappointed as most of them have shared the spirit of Christmas with the consumers and are selling goods with free gifts. Easyday one of the modern retail outlets have joined the festivity and are offering Men’s wear at an unbelievable price of Rs 200 only. Apart from this, special Christmas treats like plum cake 250g at Rs 90 and festive Swiss roll at Rs 99. They also have 50 per cent off on almost all categories of products. John Players, Woodland Levis have launched special collection this Christmas. Black Dog will come in a special gift pack for the occasion of Christmas. Christmas is an occasion where all categories of products are used for gifting purpose and hence it’s a delight for shopkeepers. Whether they sell Beer, shoes, candles, cookies, clothes, jewels and even travel deals. India is a country of festivals and the reason to celebrate joy is not important. While the Christmas fevers grips the city and the nation, the good times for the consumers will be delighted with the gifts they get and shopkeepers will smile as their pockets are loaded.